DCU President Brian MacCraith speaking with Editor-in-Chief Aaron Gallagher. DCU President Professor Brian MacCraith has said the Incorporation Programme, which has seen St. Patrick’s College Drumcondra, Mater Dei Institute and CICE amalgamate into Dublin City University this year, will mark a progressive step in Irish life towards reflecting a more inclusive and diverse society. 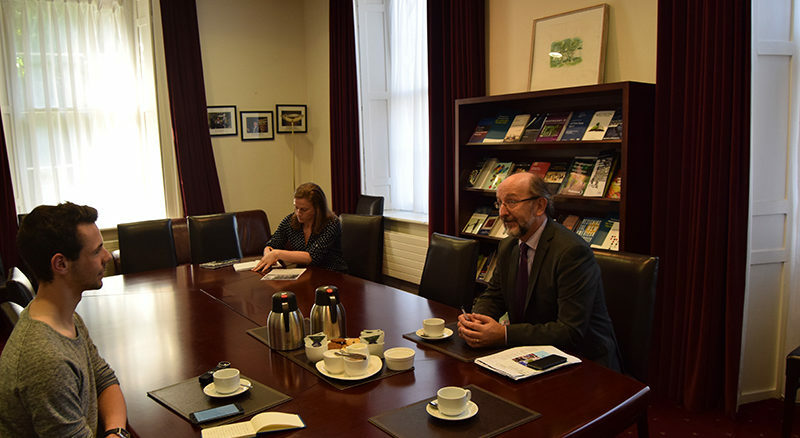 The move, finalised this academic year, brings together a long-awaited vision of the four institutes and will see the college’s student base rise to 16,000 this term, while also establishing a fifth faculty in Ireland’s first ever Institute of Education. Incorporation will see DCU staff numbers rise from 1,200 to 1,600 for 2016/17. The university also now possess a total of three academic campuses in Glasnevin, All Hallows and St Patrick’s on top of its already established innovation campus, DCU Alpha, and its sports campus in St Clares. Speaking shortly after addressing close to 1,000 incoming first year students at the Helix for the fourth time in three days, Professor MacCraith reflected that a coming together of separate denominational institutes into a secular university may not have been possible decades ago. “I think this is a symbol of a progressive, modern Ireland. I think it is very significant that this is happening in 2016,” he said. “We have spent the year appropriately looking back about the messages and the history and the achievements in 1916 and since. Certainly it is part of our view and the government’s view to spend the latter half of this year looking forward. The amalgamation of two denominational institutes in St. Patrick’s College and the Church of Ireland College of Further Education will now see just one Bachelor of Education teaching course established in DCU, with students of different religious backgrounds mixing together despite separate pathways for entry. A government directive set up by former Minister for Education Ruaidhri Quinn in 2013, via a provision in the Employment Equality Act, saw 32 places reserved solely for students of a Protestant faith in CICE. This government provision for separate pathways, which expires in 2018, carries through into DCU meaning that a student with 465 CAO points and higher level Irish could fail to secure a place in the BEd programme, while another student with 435 points and ordinary level Irish could gain entry were they of a Protestant background via the DC004 pathway. However Mr MacCraith does not view the issue of separate pathways as procuring isolation and exclusion in this instance. Rather he sees that it is put in place in order to protect minority communities of a particular denomination while also stressing how one BEd programme promotes diversity through a coming-together of students of different religions into one course. In a month dominated by sliding Irish university rankings, the DCU President added that the progress the college has made through Incorporation will likely reflect no positive difference to its chances of moving up tables such as the QS World University and Times Higher Education rankings. “Completing Incorporation in the middle of (cutbacks) is ambitious. But in fact it is quite likely that what we are doing will not help our rankings. The metrics associated with what we have created will not, in the short-term, improve our rankings, and may dilute them. But doing the right thing is more important here.